Github, probably the most famous social code hosting service just redesigned their homepage and are now featuring hosted projects. I got a very good surprise when Takeo from Powerset & Stafftool hall of fame mentioned to me that Github picked one of my gems as the first featured project! By the way, Takeo is also a Googlecharts contributor (+ a Merbist) and I had the honor to be the first one he ever forked! Another Googlecharts user, Mokolabs from Graffletopia and iCal Share also decided to try Git and Github. In no time he had forked my project, made some modifications and sent me a pull request. w00t w00t! To celebrate, we released version 1.3.4 with cleaner documentation, and enhanced features. Thanks to everyone involved in this project. And special kudos to the GitHub team for offering such an awesome service! 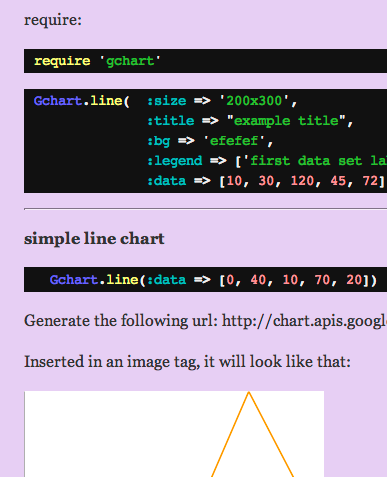 I just released Googlecharts 0.1.0 (few bug fixes and enhancements).